Ballan is a township in a rural hinterland 70 km north-west of Melbourne on the railway to Ballarat. The Western Freeway bypasses Ballan about one km to its north. The Werribee River and two tributaries are near Ballan. Its name originated from the birthplace of Robert von Stieglitz in Northern Ireland. Von Stieglitz took up a pastoral run in the district in 1836 and named it Ballan. A brother, John, had the Ballanee run, and the homestead and outbuildings constructed by a later owner are on the Register of the National Estate. In 1848 the Werribee Hunt Inn was built near the site of Ballan, and in 1850 the township was surveyed near the Werribee River. Being situated on the road to the Ballarat gold diggings, Ballan received a share of trade from passing traffic as well as rural settlement: it is elevated, and moister and cooler than the basalt plains closer to Melbourne. The Anglican community opened a church and a school in 1854 and 1855, and a Catholic church was opened in 1856. Ultimately the Catholic community gained a strong presence, and it has the large St Brigid's church (1911) and primary school (1915). St Brigid's church was destroyed by fire in 2009. 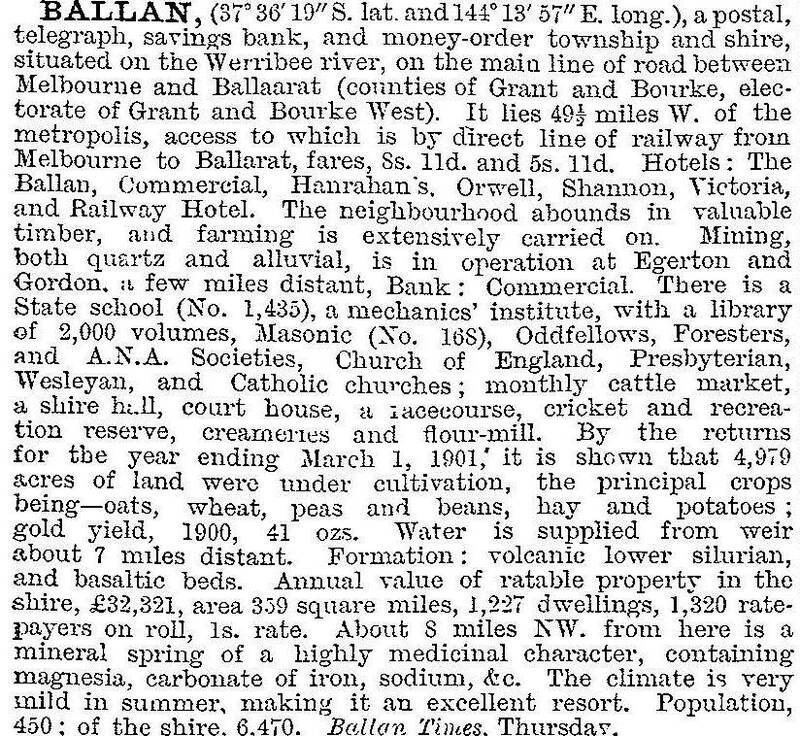 During the 1860s Ballan more than tripled its population, having shops, a flour mill (1862-1909), a mechanics' institute (1861) and a Presbyterian church (1866). The Road District (1862) was the basis for Ballan shire proclaimed on 2 November 1864. The ranges to the north of Ballan provided the site for a mineral water factory, and the mineral springs reserve in Ballan was a popular beauty spot. Ballan gained fame for having two Melbourne Cup winners owned by shire councillor, Victorian legislative councillor and local land owner, Donald Wallace. His 'Mentor' and 'Carbine' won the trophy in 1888 and 1890, the latter being one of the all-time great racehorses. Ballan had patronised horseracing since 1854 and its racecourse (1880) continued until 1969. Ballan also had infestations of rabbits, providing a source of local industry for pelts and meat and fur for a hat factory (1945). A saleyards (1907) handled conventional livestock. During the 1980s-90s Ballan's population doubled, and a range of fabrication industries and transport services have been established in the town. There are three hotels, Catholic, Anglican and Uniting churches, State and Catholic primary schools, a caravan park, a swimming pool, a recreation reserve, several sporting clubs and a golf club. A memorial hospital was built in 1966. Moorabool shire council is headquartered in the former Ballan shire office, and the local historical society is nearby in the former court house. Through traffic has been taken out of the town since the building of the Western Bypass in 1978. The railway line and station are on the south side of the town. In 2014 Ballan Primary had 148 pupils. In 2010 the Moorabool Shire rejected an application to build a wind farm at Pykes Hill near Ballan. In 2013 Victoria’s state planning minister released a planning blueprint that signaled population and employment growth in rural towns including Ballan.